This evil vizier was the head of a coup to seize control of the Gungeon from its true Master. He appeared in fair and friendly form to the Bullet Kin and promised them prosperity. No one knows where he came from or how he learned his particular style of Ammomancy. Imprisoned in a great cell long ago, he plots his escape. Agunim is one of the two bosses of The Bullet's past. He also appears in a helicopter as the boss for the R&G Dept. In The Bullet's past he appears as the right hand of Cannon, as a skilled wizard who wishes to help him dominate the Gungeon. In the R&G Dept. he looks older, angrier, crazier and actually has a voice. Fires several streams of bullets shaped like lightning bolts that move erratically. Fires a wide spread of randomly scattered bullets. Fires a small cluster of bullets. Fires a large purple orb which can be reflected using Blasphemy to damage him. The second time, he will reflect the orb back twice; the third, four times. After hitting him three times with the purple orb, he will be defeated and a hole in the arena will appear leading to Cannon. "So, it's you. The bullet... person. The spell is almost complete. Soon, my QuickDraw master rises. All bullet kin will be slaves to his grandeur. To be fired by HIS WILL! I have learned from your undead master, but I am not his kind! The usurper shall soon reign! Turn back now! Return to your chamber and rejoin the rest of your pathetic kind! Or, do you think you can stop me? GO AHEAD ON!" Shoots 2 columns of flame-shaped bullets, which then create fire between them. Shoots many big bullets in bursts of 6. Shoots streams of bullets shaped like lightning bolts, as in his past fight. Shoots 2 spreads of 4 big bullets. Agunim's encounter in the R&G Dept. is unique in that he is fully voice-acted. "You're the only one who can free me!" "So you've finally jumped into my hole!" "So you've finally come into my hole!" "I've been aiming for this!" "I'll send you to bullet hell!" "I'm afraid I can't let you... kill your past." "What is this child you have brought with you?" "Your very presence insults me, child." "I'll kill you, then my past!" "You'll make a beautiful sacrifice..."
"Bested by your own slow reflexes!" "Oh~ not enough firepower it seems?" "You got all the good guns!" "I got all the bad guns..."
Agunim's attacks in the Bullet's past are identical to Shadow Magician's. His Ammonomicon image and character sprite are also similar to those of the Shadow Magician, but with a change to the color palette. 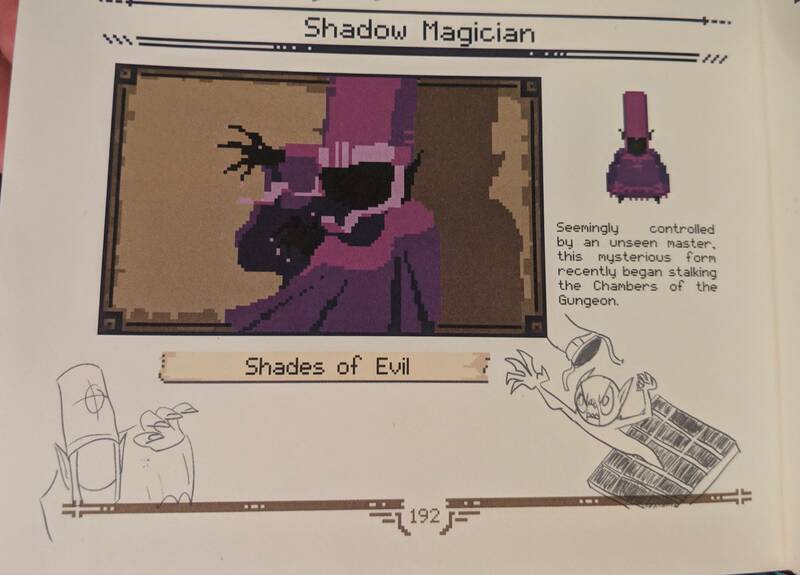 This possibly relates to the Ammonomicon entry stating that the Shadow Magician is "controlled by an unseen master" and how Agunim is said to still exist within the Gungeon, attempting to escape. If so, the Shadow Magician could be a puppet being used by him to aid with his plan. The Shadow Magician is even referred to as "shadow_agunim" in the game files. Agunim is a reference to Agahnim from The Legend of Zelda: A Link to the Past. The similarity to the Shadow Magician is also a reference to The Legend of Zelda: A Link to the Past, as you fight copies of Agahnim multiple times throughout the game. Even with the Galactic Medal of Valor, it will take three orbs to kill Agunim. This is probably because the orbs are not an attack done by the player, but by Agunim himself. Art from the physical Ammonomicon shows that Agunim is the Sell Creep. With this in mind, it seems the R&G Dept. is the "great cell" he was imprisoned in. In the boss encounter screen from the R&G Dept. it says "Cam Clarke as... Agunim". Cam Clarke is the voice actor for Liquid Snake, and the battle in the R&G Dept. is a reference to the Hind D battle in Metal Gear Solid. His quotes when you defeat him are a reference to the lines Liquid Snake says in Metal Gear Solid. Agunim in opening of the R&G Dept. seems to be wearing a red loin cloth. Agunim's boss fight is the only one which doesn't have any entries in the ammonomicon. During the introduction phase of the R&G Dept. boss fight, one of Agunim's opening statements was originally "So you've finally come into my hole!" However, this line was changed in a subsequent patch to "So you've finally jumped into my hole!" This was most likely done because the former line could be interpreted in a sexual manner. This page was last edited on 18 April 2019, at 21:40.